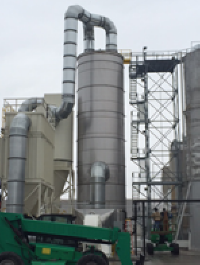 Evaporator Dryer Technologies provides a spray chilling process by means of a Prilling Tower. Our Prilling Towers allow for the formation of uniform or random spherical product particles derived from molten product. The Prilling Tower is designed with a full diameter air disperser at the bottom of a high tower to evenly distribute chilled air. Melted, liquefied product is fed at the top of the prilling tower via a spraying or atomizing nozzle to disperse liquid droplets into the chilled air. As the droplets fall they cool and solidify individually forming spherical balls referred to as prills. The prills collect at the bottom of the tower and are discharged through a rotary airlock. Warm air from the heat exchange between the molten material and the chilled air exits at the top of the tower. EDT prilling towers can be designed with an integrated fluid bed to provide additional cooling time and increased solidification. Evaporator Dryer Technologies custom sizes each prilling tower in accordance to product specifications and desired flowrates to obtain optimum prills. Our towers are available in a sanitary or non-sanitary design and are manufactured from stainless steel. All other materials can be FDA compliant.